I ventured north on a day that I knew the weather was going to be questionable. Temps would rise only to 35F and the snow fell at varying clips throughout the day. 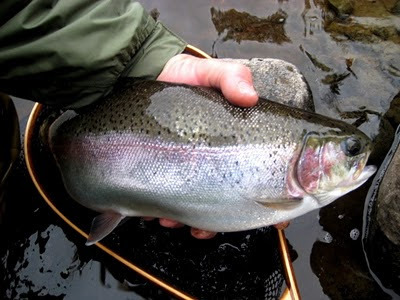 I went into the day with an open mind knowing that the chips were stacked against me but hoped that I might connect with an early season Rainbow staging for the spawn. My expectations were exceeded. The action woefully began with 6 nice Pickerel and slowly morphed into a Rainbow festivus. Labels: Dead River, Fish, Fishing, Rainbow Trout, Spring Fishing, taking names. The picture uploads kept occuring in this strange vertical format....Chet any chance you can correct that and set them horizontal? why fish for trout when poseidon is givithing a solid pickeral bite? JK bro. Awesome trip indeed! One for the books! Holy shitballs that's a chunky rainbow. so fat. so giving, poseidon be. keith, maybe we should launch the o.i. on the scogg and just slay pickerel.